Well, welcome to my second tutorial. This is a sort of advance texturing tutorial that, hopefully, will be straight forward enough for even the beginner to understand. There will be parts of this tutorial that will be very, (and I mean VERY), basic for the somewhat experienced, or above average Photoshop user, but I feel that these items need to be explained for the general user or newbie to texturing or Photoshop. I am assuming that you have either a version of Photoshop or GIMP. I am using Photoshop 7 and all of these steps will be based on this application. GIMP seems to be very similar in actions, so if you are using GIMP, it should still be fairly easy to follow the steps. I typically use very large images, as this results in a higher resolution render. 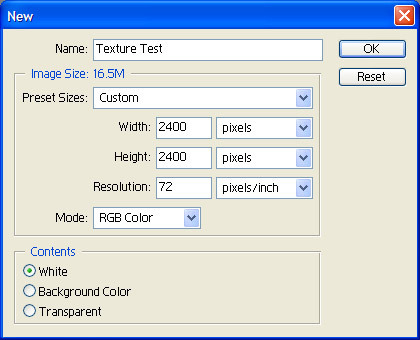 So set the image size as shown and name the PSD file what ever you want. You can play around with the resolution here as well, but I find that the default of 72 pixels/inch is adequate enough. Press ok and a new, blank window will appear. Now select a base colour that you would like to use. This colour is totally up to you for the project that you are doing. I used a nice blue colour, (R=98, G=84, B=233). Now select the Bucket Fill tool and then click within your open window. This will fill the window with your base colour. That is it for the basic colouring. On to adding the rust and dirt.